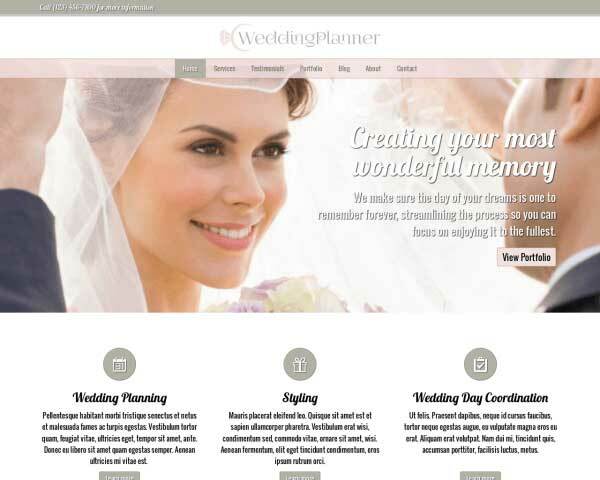 With the Wedding Photographer WordPress theme you can easily create a stunning online portfolio for your photography business even if you're on a budget or you've never built a website before. Just replace the demo text and photos with your own and it's done! Whether you're a professional photographer or a part-time hobbyist, the Wedding Photographer WordPress Theme is an ideal way to showcase your photography portfolio online. This website template's clean, elegant design keeps the focus on your photos while useful features like social media options, a built-in blog and an SEO manager help you attract visitors and grow your client base. Pages for your bio, contact details, rates and multiple image galleries are already set up with demo content waiting to be replaced with your own text and photos. Using our unique front-end editing tool and drag and drop widgets, you'll be able to personalize the color scheme, style text and rearrange page layouts without any coding at all. 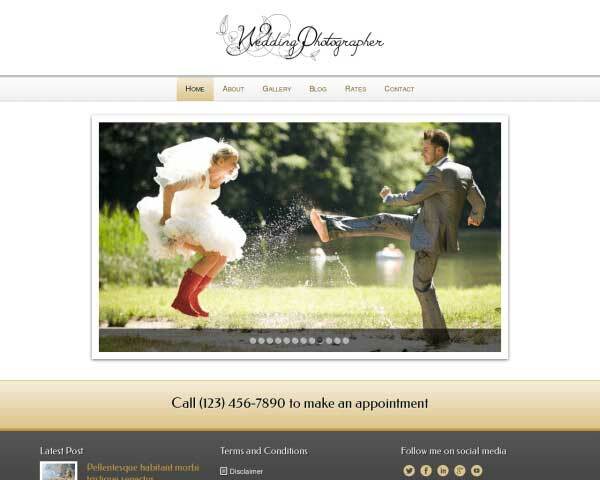 Featuring responsive design, integrated Google fonts, and lightbox image galleries, the Wedding Photographer WordPress theme is a quick, affordable way to build a great-looking wedding photography portfolio you can be proud of. 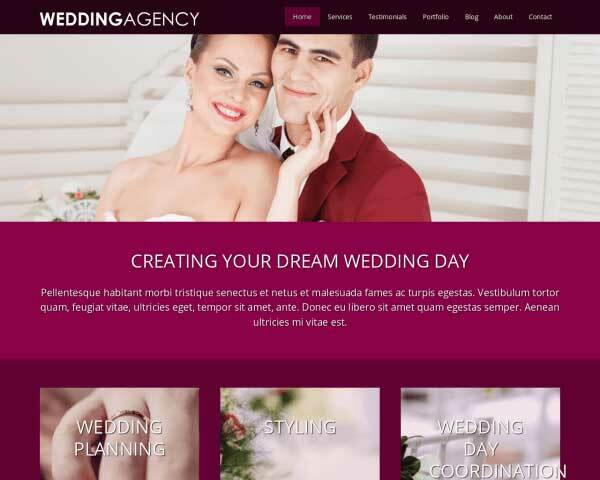 Increase customer expectations with Wedding Photographer WordPress Theme which was made specifically for wedding photographers. 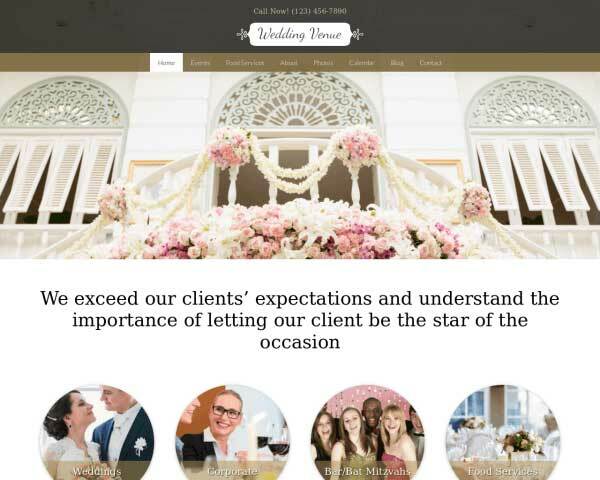 Prospective clients won't have to search to take the next step and get in contact thanks to a clear call-to-action on every page of the Wedding Photographer WordPress Theme. 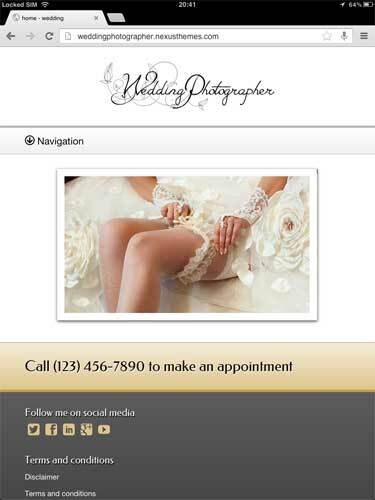 An image slider has always been a great way to enhance the design of any website. 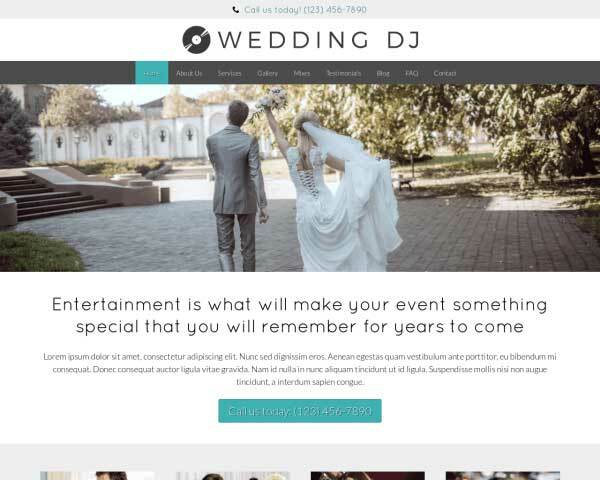 This Wedding Photographer WordPress Theme includes a preconfigured slider which is incredibly easy to make your own. While a contact form is the staple of any website, it is often the most neglected page. 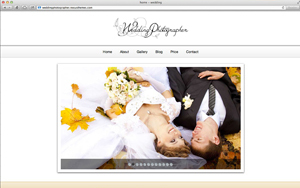 Not so for the Wedding Photographer WordPress Theme. It goes beyond the standard contact page functionality. 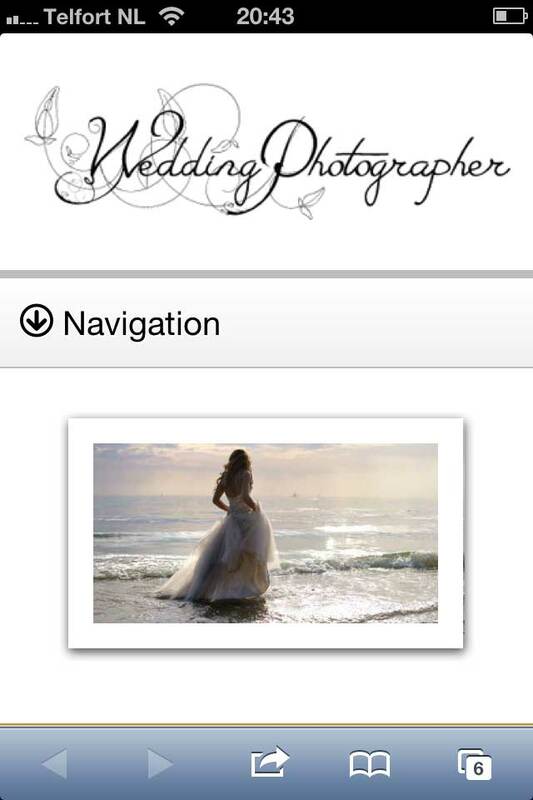 Display your photos in elegant lightbox image galleries with the Wedding Photographer WordPress Theme. You can add multi-column photo galleries to any page or post. 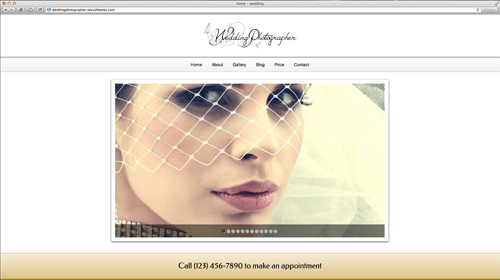 Outline your rate structure and services on the dedicated page of the Wedding Photographer WordPress Theme. Add rows, columns or price charts as needed. 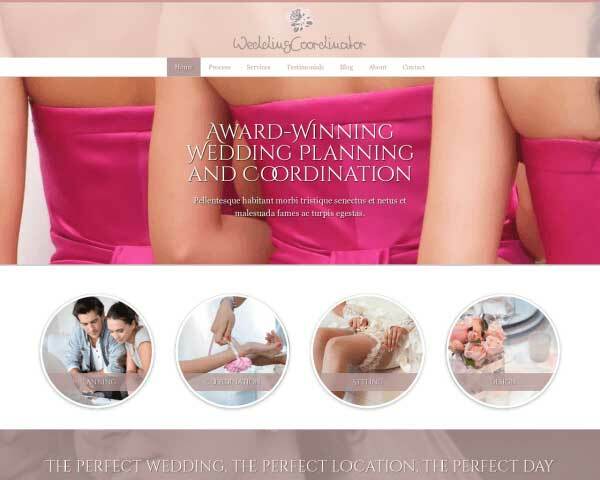 You won't lose time searching for plugins when this Wedding Photographer WordPress Theme comes packaged with icons for popular social media platforms as well as Facebook and Twitter widgets. Add a personal touch to this WordPress theme for photography businesses by introducing each staff member with a photo and short bio. 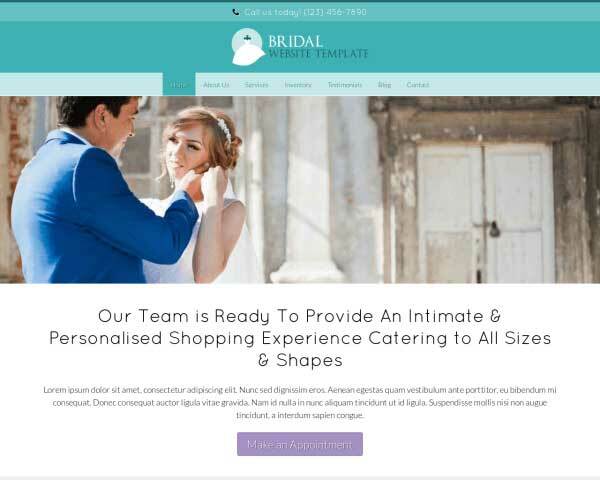 A sleek mobile version of your website is part of the package when you build your website with the responsive Wedding Photographer WordPress theme. Our mobile-optimized design automatically adjusts your content to display beautifully on all handheld devices. Absolutely no coding or plugins are required! Mobile visitors will enjoy the same professional look and functionality of the desktop version when using smartphones and tables to browse your pages and galleries.